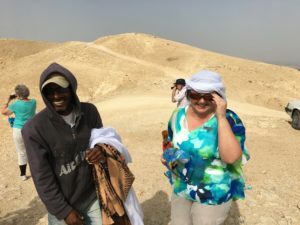 Today was our last day in the desert – we will never read about the Negev, the Arava, the Judean wilderness without feeling the heat and tasting the sand. We said good bye to the Dea Sea and headed north. En Gedi is one of our stops, Jerusalem is where we will end up tonight. We started our day at Masada, by 8:30 am the heat was already hard to take. 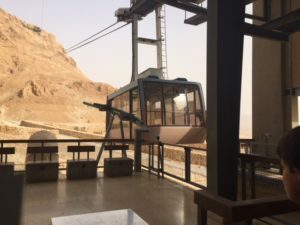 We were grateful for the cable car that took us to the top of Masada. Masada is a natural fortress (you have to look up the aerial views yourself), reinforced by walls built by Herod the Great. Remains of the Roman conquest of Masada in about 74 AD are still very visible. Entering Masada, a place that symbolizes the national Jewish resistance. 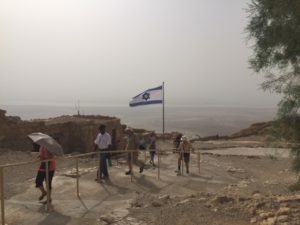 The Israeli forces used to swear in their oath to serve right here on Masada, with the cry “Never again Masada”, meaning that as a people they will never allow themselves to be in a position of either surrender of death. 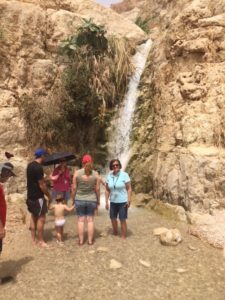 En Gedi (meaning the “spring of a kid”) is a well hidden oasis in the wilderness. According to 1 Samuel 24 this was one of David’s hiding places. No wonder – fresh water is plentiful here, as were ibexes (sort of an antelope) and rock badgers (sort of a small cute gopher variety). We saw some of each today. We stopped for a quick consideration of 1 Samuel 24 – David’s encounter with Saul right here at En Gedi. The caves where this incident might have taken place are plentiful here. 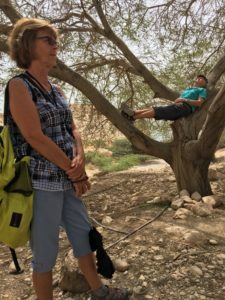 This is the way to enjoy the En Gedi park while listening to scripture. 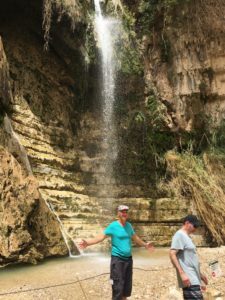 Dipping our hot feet in the refreshing pools of En Gedi felt great. Some were not satisfied with getting just their feet wet and let the falling waters soak them through and through. Again, our hikers climbed to the highest pool with the biggest waterfall – David’s waterfall. We made a quick stop to the well-air-conditioned Ahava factory and show room. I sure hope someone took pictures of Ahava’s space-age chairs! 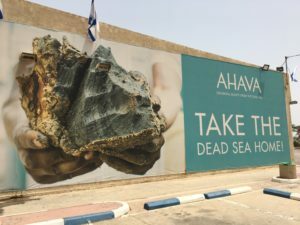 We sat through an interesting presentation of the history and the technology of mining the dead sea salt, mud, water, and plants to make top quality products. The prices made us swallow hard, but the products are top notch. From here we drove to the top of the Dead Sea to the site of the Qumran community and the place where the Dead Sea Scrolls were discovered. 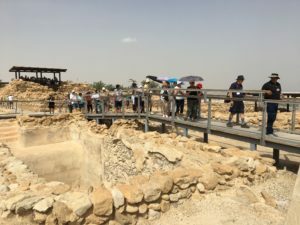 We came to the overlook of Cave 4Q –perhaps the most recognizable of the Qumran caves. Our group admiring the remains of the Qumran community of Essenes. 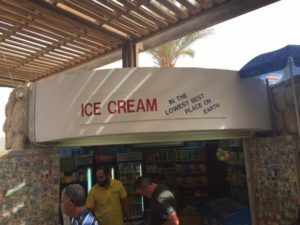 Ice cream is popular, though in this heat you have to eat it fast. 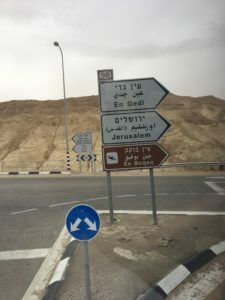 We drove past Jericho, and started heading up hill toward Jerusalem. 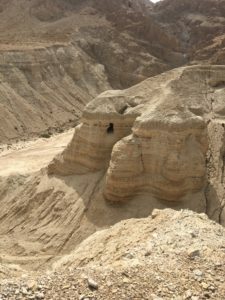 Partway through the climb was our last stop – an overlook of the Cherith valley (1 Kings 17) where God sent ravens to provide bread for Elijah. This is also the path the travellers in Jesus’ time would take from Jerusalem to Jericho. 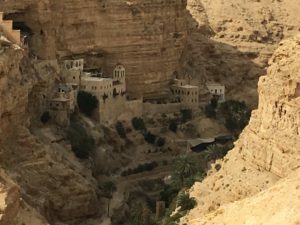 We pondered the meaning of the Good Samaritan parable as we admired the picture-perfect St. George Greek Orthodox monastery. Shopping comes to you in Israel – the salesman thought I’d love this look – I don’t think it’s me. A short while later we drove under the Mt. 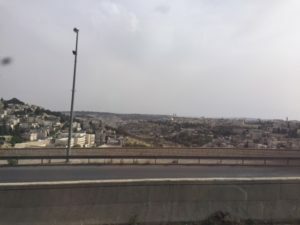 of Olives and had our first glimpse of the Old City of Jerusalem, with the easy-to-stop gold dome. Tomorrow is all about the Temple – we will be visiting many busy sites, all within a stone-throw from the Temple Mount. Please pray for our safety, for stamina, and that in all that hustle and bustle we would not miss God.